Could you pick collard greens out of line-up? It’s not an easy thing to do considering how many varieties of leafy greens are available. The bigger question is, have you ever picked up collard greens at all?? I avoided collard greens for a long time because they looked so intimidating, and because I didn’t know how to cook them. I had never seen a recipe that didn’t boil those beautiful leaves to oblivion. 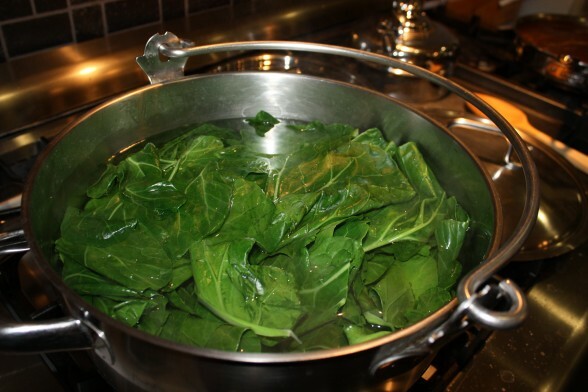 A typical collard greens recipe is from the South where they simmer the greens with bacon and pork stock for an hour so that they’re tender and the bacon masks some of the bitterness that goes along with collards. I’m sure they’re tasty, but I try to lightly cook my vegetables as much as possible, especially greens to keep that beautiful bright green color and the vital nutrients. 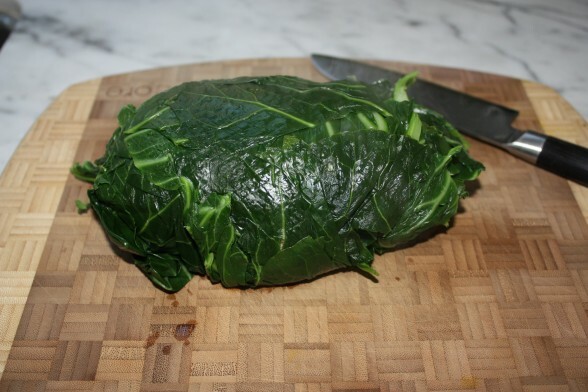 The only time I had actually tried collard greens was raw, wrapped around hummus, sprouts and shredded vegetables — kind of like a veggie wrap, but a raw collard leaf instead of a tortilla. Not delicious. Fine, but who wants to eat fine? I am obsessed with dark green leafy vegetables and I am always trying to find new ways to incorporate them into our diet. I always say they should be their own food group since they are some of most nutrient-dense foods available to us and they can be prepared in so many delicious ways. Dark green leafies are incredibly rich in calcium, magnesium, beta-carotene, Vitamin K and iron. They also contain loads of fiber, Vitamin C, folate and antioxidants. Collards, specifically, are also members of the cruciferous family of vegetables which studies have shown may reduce the risk of many cancers. I knew I needed to give collards a chance. 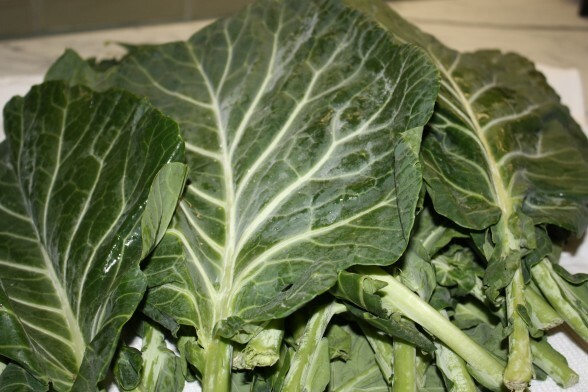 Collards can be a little bitter, which is not a flavor picky children and formerly picky children husbands warm up to. My first attempt to simply saute chopped collards with garlic olive oil was not the solution. 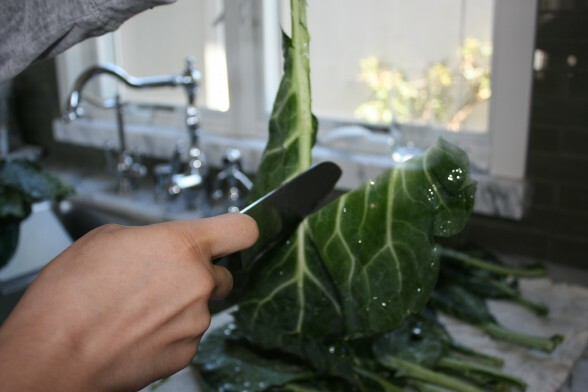 But I found that if you blanche collards first in plenty of salted water, it cuts the bitterness significantly. I am aware that blanching, which means to boil in water for a short amount of time, reduces the vitamin content more than steaming. But you still keep most of the vitamins. 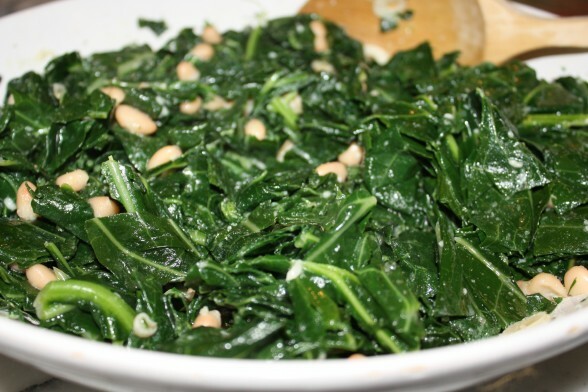 This recipe for collard greens has become one of my favorite ways to eat greens. 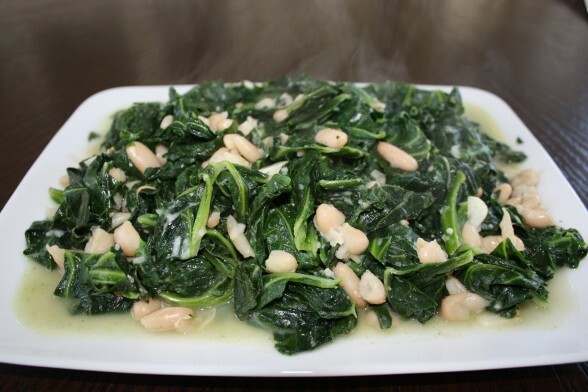 After the greens are blanched, they join garlic, olive oil and high-protein, creamy white beans for a very satisfying side or vegetarian main dish. The addition of grated Pecorino-romano is optional, but adds a nice richness. I have enjoyed collards this way by themselves or over cooked millet or rice. Daughter #1 loves this on top of a toasted wedge of whole grain bread. Maybe you’re not sure if your family is ready for collards. Even if that’s the case, do try this recipe anyway with another favorite leafy green, such as kale, Swiss chard, or escarole (even broccolini.) In time, you’ll want to pick this recipe out of your menu line-up, trust me! Fill a large pot three-fourths full with water. Bring to a boil over high heat and add kosher salt. Submerge greens in salted water and blanche for 5-8 minutes, or until tender. Remove some of the cooking liquid if that’s what you want to use. Drain the greens in a colander and press against the leaves with a large spoon to squeeze out some of the excess water. You can also do this in a clean kitchen towel, but it will be hot! Transfer to a cutting board and chop in large pieces. Warm the olive oil in a large skillet over medium heat and add the garlic and red pepper flakes, if using. When you see the first signs of a golden color on the garlic, add the collard greens. Sprinkle with the sea salt and stir to coat with the oil. Add the beans and stock or cooking water and simmer uncovered for 5 minutes, until the liquid has reduced a bit. Stir in the grated cheese and taste for salt. Serve immediately. I can’t wait to try this recipe. I love my veggies but do not have a good recipe for collard greens. Let me know how it turns out. Just had this last night over a bowl of millet. So delicious! Well I mentioned in my comments that I was going to make this dish. I made it on Friday and it was absolutely delicious! My five year old son loved it. My picky 3 year old daughter tried some and loved it too! Adding the grated cheese gave it such a nice flavor. Thank you for such a delicious recipe. I’ve made this type of dish many time with escarole. You are motivating me to try collard greens. Can’t wait. Yes, it’s a riff on the classic escarole and beans which was one of my favorite side dishes growing up. I can’t decide which way I like better! I love cannellini beans and so does my 5 year old son. I am going to make this tonight. I will let you know how it tasted. I’m sure it will be delicious since everything else I’ve tried on your website has been!